Le Cafe Vert in the Deadpool? 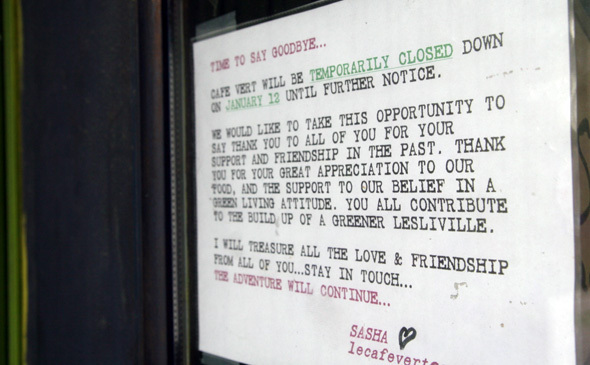 It looks like Le Cafe Vert has served its last meal of gluten free pancakes. The once popular Leslieville brunch and organic eats spot closed its doors on January 12th with no announced plans to re-open. A sign on the door hints that the closure may be temporary, but like nearby Kubo Radio (which will re-open as Roy's pub in the Spring) rumours abound that the restaurant is done for good. Here's a look at the notice stuck to the front door where the owner thanks past customers for their support and friendship. For those keeping score, this is yet another place that has succumbed to the often-fatal Restaurant Makeover.